The Swazi U/19's players with John Fisher SchoolSaturday the U/19's were in action against UK visiting school John Fisher. SRU President Michael Collinson was there to watch both games "We were witness here today to some great rugby from both sides. What we Swazi's lack in size, we make up for in speed. The U/19's side with Pocklington SchoolPocklington School proved too strong for the Swazi U/19's and U/17's side this week. Although the Swazi's put up a good fight, it was not to be their day. A big thank you to all of the players for their efforts and commitment. 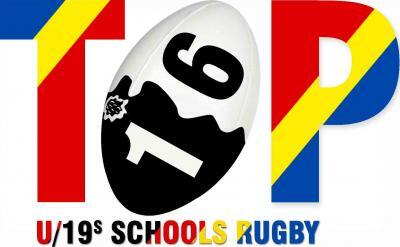 .The U/19's TOP16 Inter Schools 7's Rugby Tournament will kick off this month. Twenty four schools have applied to play in this years TOP16. The preliminary games will start next week and from there the four pools will be announced. The SRU announced today that the U/19's 15's side will be in action in July playing against four visiting UK schools. Head of Coaching and Development Michael Dos Santos made the announcement yesterday. The four schools will be. Woodhouse Grove, Pocklington, John Fisher and Kings School Worcester. "We will start training in the coming weeks. The four games will be tough, but I know the players are up to the challenge" said Dos Santos. U/19's to be in action against two visiting schools. It was announced today that the U/19's national side will be hosting two visiting UK schools later in the year. The first fixture will be on Thursday July 17th against AKS Blackpool. the second fixture will be on Friday July 25th against Solihull. Banele Magagula with the eighty litres of paintThe prize for winning the 'Plascon Paints' Player of the Tournament at the Swazi Choice TOP16 7's tournament was eighty litres of paint to paint a classroom at the winners school. Banele Magagula will be taking the paint back to Dvokolwako High. Player of the Tournament Banele Magagula scoring a try in the final against Mananga CollegeAt the end of the Swazi Choice TOP16 7's tournament played at the Mavuso Sports Centre on Friday, the match officials selected Dvokolwako High player Banele Magagula as the Player of the Tournament. .The Swaziland Rugby Union's Swazi Choice TOP16 7's tournament organiser, Wilson Dlamini announced the two pools for the TOP16 Final to be played at Mavuso Sports Centre on Friday July 19th. Dlamini made the announcement on Swazi Radio yesterday. Plascon Paints Peter Baker handing over the TOP16 Player of the Tournament prize to Wilson DlaminiIn an exciting twist to next weeks TOP16 U/19's 7's final, Plascon Paints Swaziland have donated eighty litres of paint as a prize to the Player of the Tournament for his school.